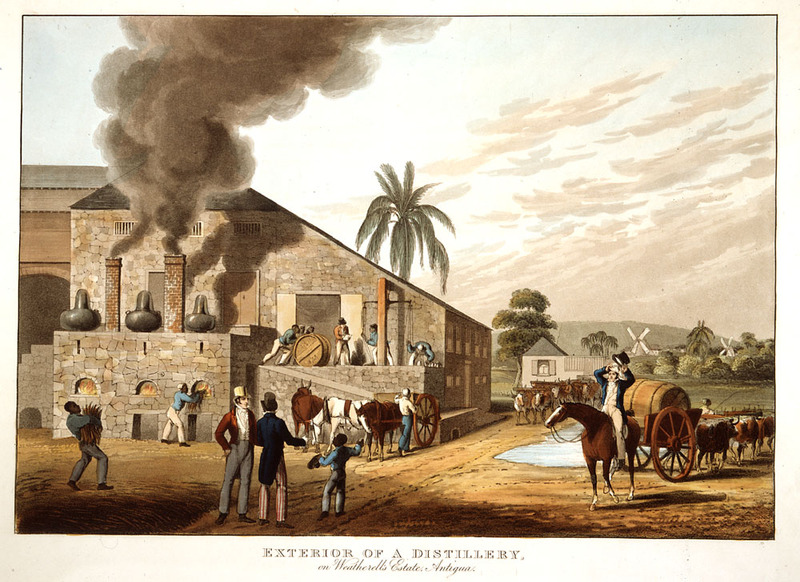 William Clark, Ten Views In the Island of Antigua, in Which are Represented the Process of Sugar Making.... From Drawings Made by William Clark, During a Residence of Three Years in the West Indies (London,1823). Copy in Beinecke Lesser Antilles Collection, Hamilton College Library, Clinton, NY. Caption, Exterior of a Distillery, on Weatherell's Estate. Shows cane trash being fed into the furnaces, people rolling hogsheads of rum, cattle carts hauling the hogsheads, white overseers/managers; in background windmills used for grinding the cane. Little is known of William Clark although he was probably a manager or overseer of plantations in Antigua. The ten prints in the collection (only 9 of which are shown on this website) are based on his drawings, converted into prints by professional printmakers. All of the prints are shown and extensively described in T. Barringer, G. Forrester, and B. Martinez-Ruiz, Art and Emancipation in Jamaica: Isaac Mendes Belisario and his Worlds (New Haven : Yale Center for British Art in association with Yale University Press, 2007), pp. 318-321; the descriptions in this publication are based on Clark's unpaginated text and quotations from that text. Special thanks to Randall Ericson, Couper Librarian, Hamilton College.